$50+ Orders delivered in Continental U.S.A.
60 X 33 roll-in shower stall is barrier free shower with a center drain. It is a beautifully choice for your bathroom remodel. Great for Bathtub to Shower Conversions. EZ Able® offers only US Made premier walk in bathtubs and showers. This is a roll in shower. It is perfect for bathroom remodel where you want to convert a Bathtub to a Shower because it comes in five pieces which makes it easy to get into your existing bathroom. This roll-in shower stall the perfect choice for people desiring a barrier free shower. Since it is 60 long (5 foot) it is the number one choice for people replacing an existing five foot tub. What is great about this roll-in shower is that it is also available with a center drain, right drain or left drain configuration. Look to this bath to shower enclosure to create a walk in shower to increase your bath safety. With this shower's barrier free entrance and non-split floor you can safely move in and out of this shower. This is a great shower for any location where barrier free access is desired. Since the shower walls are plywood backed accessories; like a shower seat; can be mounted almost anywhere. Make bathroom remodel choices that improve shower safety today and into the future. Specifically designed for your bathroom remodel project! Quality you can see. EZ Able® Showers have a reinforced, pre-leveled base and an AcrylX™ (Applied Acrylic) finish. AcrylX™ Applied Acrylic is a brighter, more lustrous white; thus, providing aesthetic appeal to your bathroom. With less dulling and more shine to the finish, AcrylX™ products will stand the test of time. AcrylX™ Applied Acrylic is a tremendous innovation in the bathware industry. Tested and value proven, AcrylX™ products bring luxury to the everyday bath market. The pre-leveled shower base problem solving feature is of tremendous benefit to construction plumbers, developers, and owners by saving installation time and money, minimizing risk of water drainage problems and soft shower bottoms. Pre-leveled shower unit is ready to install on an solid, level floor. EZ Able® shower bases are so strong that they can be set with construction adhesive. Say goodbye to traditional mud set shower bases which are known to not drain properly. 5 Piece unit that you can easily get into your existing bathroom. Place Grab Bars Anywhere! - Plywood Reinforced Walls. Accessories available: Shower valve, glide bar/hand shower, seat, grab bars, collapsible water stopper, drain, curtain and rod. The standard shower color is WHITE. Many custom body colors are available. What is Over the Road Shipping? MADE TO ORDER PRODUCT | TYPICALLY SHIPS IN 3 - 5 BUSINESS DAYS when ordered on Standard Business Days (M-F) before 12PM EST. AcrylX™ with the Strength of ArmorCore™ 30 Year Warranty American Bath Group, the manufacturer of EZ Able® Products, warrants to the original purchaser and consumer that its products will be free from defects in material or workmanship when properly installed pursuant to American Bath Group installation instructions for the following warranty period: Thirty (30) Year Warranty AcrylX™ (2) CenturyStone™ Upon inspection by an authorized representative, American Bath Group will repair or exchange at its sole discretion, any unit found to be defective in material or workmanship. The exchange of a unit will only be considered when American Bath Group has eliminated all options to restore the unit to acceptable factory condition. Exchange of a unit is limited to supplying replacement product of comparable size and style, and does not include any cost of removal or installation. EXCEPTIONS This warranty shall be voided if the unit is moved from its place of initial installation or is not installed in accordance with the instructions supplied by the manufacturer of the unit. American Bath Group will not be held responsible for any damages resulting from improper installation. Further, this warranty does not apply if the unit has been subjected to accident, abuse, misuse, damage caused by flood, fire, or other force of nature. Any unauthorized repair or modification to the product would render the warranty null and void. This warranty does not apply to any equipment or accessories not installed by American Bath Group and American Bath Group will not be held liable for any results of such acts. American Bath Group is not responsible for any consequential or incidental mishaps, inconvenience, time loss, incidental expense, materials or labor related to the installation of hardware or the actual tub. The owner agrees by use of the unit that the obligations of American Bath Group shall not extend to contingent or indirect damage or injury to the structure of its contents, that the obligations of American Bath Group are limited to those set forth herein, and that no other obligations, expressed or implied, are assumed by American Bath Group. The product is not recommended for outside storage. To obtain warranty service, the Customer must give prompt notice to American Bath Group of any claim. Free Shipping* is ONLY AVAILABLE FOR PRODUCTS SHIPPED WITHIN THE CONTINENTAL USA. Please call Call 877.392.2531 877.392.2531 for shipping availability and cost to ship to locations outside of the Continental USA. EZ Able® sells and ships within the Continental U.S.A. We ship through various channels and each has it's own lead time. Many of our products are custom and made to order. Please understand that these products take longer to ship because they are made, in the U.S.A., specifically for your job. MADE Upon and Made to ORDER products TYPICALLY ship within the stated timeframes. 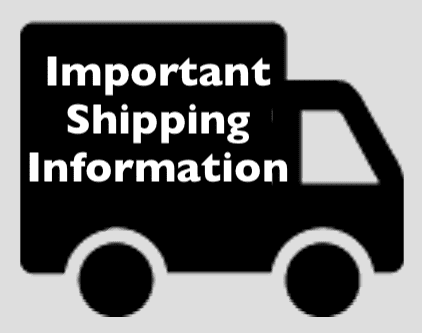 Shipping times may be delayed by circumstances beyond EZ Able's control including but not limited to: Labor Strikes, Manufacturing Delays and Backlogs, Weather Delays, etc. MADE Upon ORDER Walk-in tubs, Showers and other products have ship times which vary by model and range between: 3-7 business days. *Free Shipping refers to ground / over the road delivery only. Expedited delivery service may be available for an additional fee. Please call Call 877.392.2531 877.392.2531 to learn if expedited delivery is available for your item. *Free Shipping is only available within the Continental USA. EZ Able® emails our customers Tracking Numbers / Pro Numbers with every order. IT IS THE CUSTOMER'S RESPONSIBILITY TO INSURE RECEIPT OF THE ORDER. If your shipping carrier states that your package was delivered and you haven't received it. Customers have 36 hours to notify EZ Able® of the lost/stolen package in order to qualify for a replacement item. We try to make it easy. You may place your order online or over the phone. If you need assistance, please call 877.392.2531. Please feel free to call 877.392.2531, connect with us via our online chat, or use our consultation form. Start by logging into your account. Under ORDERS, click on the tab called RETURNS. Once you fill out and submit your return request, then EZ Able® will begin the Return Authorization process. Some items are returned directly to EZ Able, while others are returned directly to the manufacturer. Return Authorization processing times vary by manufacturer. Please allow 1-5 business days to receive your authorization via email. The emailed Return Authorization Form will have all of the information necessary to return your item. You are responsible for return shipping. The restocking fee, if any, will be listed on the Return Authorization Form. Do you ship to Canada? Hawaii? Alaska? Some items are available to be shipped internationally or to Alaska or Hawaii. Please contact EZ Able® to determine the availability of your product. Please feel free to call 877.392.2531, connect with us via our online chat, or use our consultation form. I can't place my order? What is going on? EZ Able® can't ship to PO Boxes. Our online store does not allow check-out for deliveries which require custom shipping quotes. Those destinations include, but are not limited to: Canada, Mexico, Hawaii, Alaska, etc. Please contact EZ Able® to determine the availability of your product. Please feel free to call 877.392.2531, connect with us via our online chat, or use our consultation form. I need a product specification sheet?